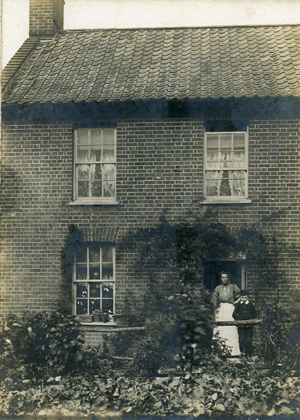 Photos shown here are believed to be from outside Cambridgeshire. Do you recognise the location or occasion? Any help in identifying these will help us to get them to an owner who will appreciate them and ensure their future safekeeping. Can you help us to rescue these strays? We also have some mystery masonic photographs on which we would welcome information. If you recognise any of these images please contact webmaster@fadingimages.uk. 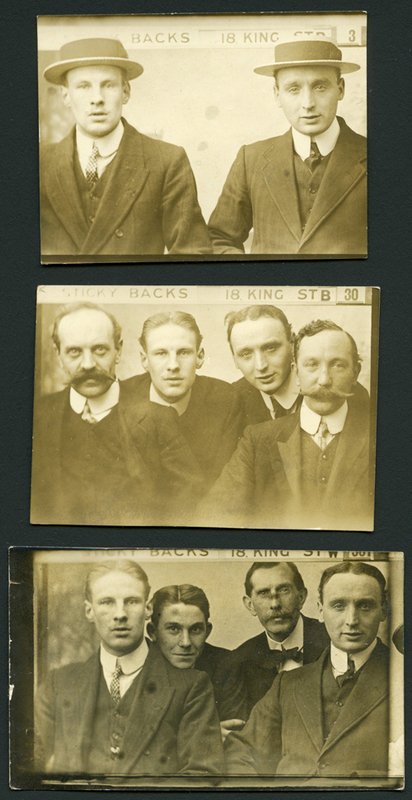 1. Who was the Sticky Backs photographer with a studio somewhere in the UK with an address of 18 King Street who took these photos? We have researched quite an extensive list of Stickyback photographers in England, Ireland, Scotland and Wales which you can see on the site at www.fadingimages.uk/stickyback.asp. Unfortunately none have been found to match this address. Only one photographer at 18 King St has been found - A.E.Jewson of 18 King Street, Kings Lynn, but the firm was at this address in the 1933 Kelly's directory and in earlier directories, including 1916, closer to the date when these photos were taken, their address was 20 King Street, making them a rather unlikely match. Any other suggestions would be very welcome. 2. Stickybacks in Tasmania, Australia. We were delighted to hear from Priscila Cox in Tasmania, who recently found the mounted Stickybacks photograph shown below abandoned in the loft of her house. The house dates back to the 1820s. The photo measures 1 1/8” x 1 1/8” and the mount, with brown stars, measures 2 1/2” x 3”. The mount has the name "Stickyback Photo Co" printed on the face. This precise company name has not been found on UK advertisements. Priscilla believes this was taken in Tasmania rather than the UK and has found a number of newspaper advertisements for a travelling stickyback photographer in Tasmania. The North West Post 24 Aug 1910 p2 states "Stickyback Photos - The Stickyback Company announces that their Devonport season is drawing to a close. 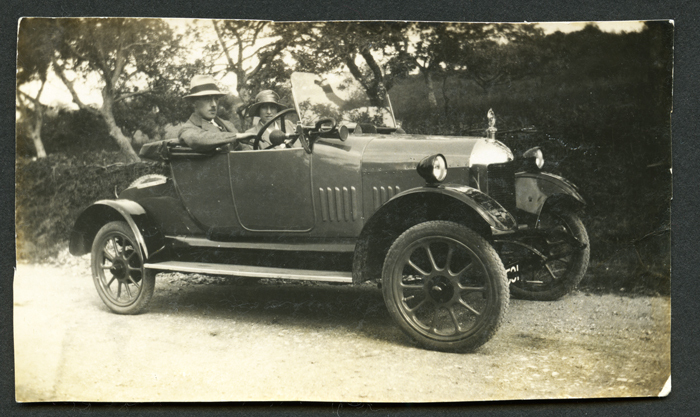 the privilege of securing 16 photos for 1 shilling has been largely availed of and samples of their photos taken in Devonport are now on view at Messrs G and A Ellis, Ulverstone, which will be the next town visited." The North Western Advocate and the Emu Bay Times 30/8/1910 p2 reported "Stickyback photos have been all the rage for the last few weeks. The studio closes in a few days time". 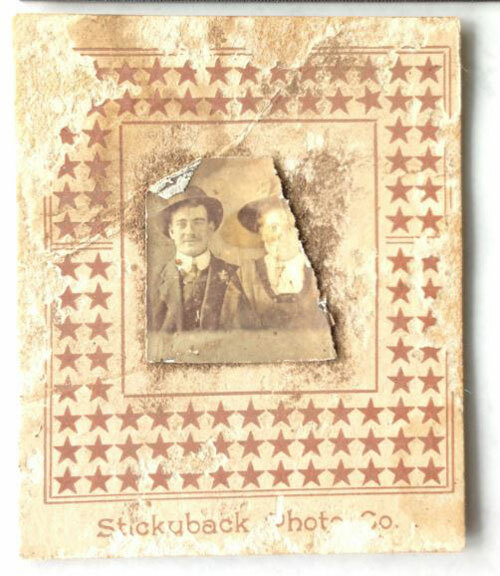 Have you come across the "Stickyback Photo co" or a Stickyback photographer who went to Australia? Do you recognise this star design mount, or the subjects of the portrait? 3. 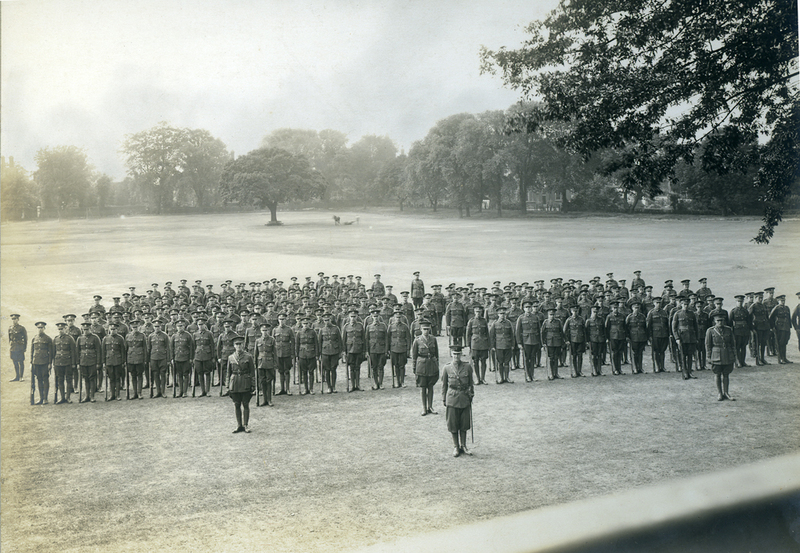 Where is this army cadet parade taking place? The photo below (11x9in) is by Bassano Ltd 38 Dover Street London. Around 200 army cadets in uniform are on parade on what could be a large school sports field. In the edge of shot is a white cricket screen and in the background is someone is operating a horse drawn mower. The photo seems to be taken from a building looking down on the parade. Could this be somewhere like Wellington College or Highgate School? It is presumably somewhere within striking distance of London. The date - possibly between WW1 and WW2. According to PhotoLondon, Bassano Ltd were at 38 Dover Street, Westminster February 1921 - 1953. Below the main photo are a couple of close-ups of detail . 4. 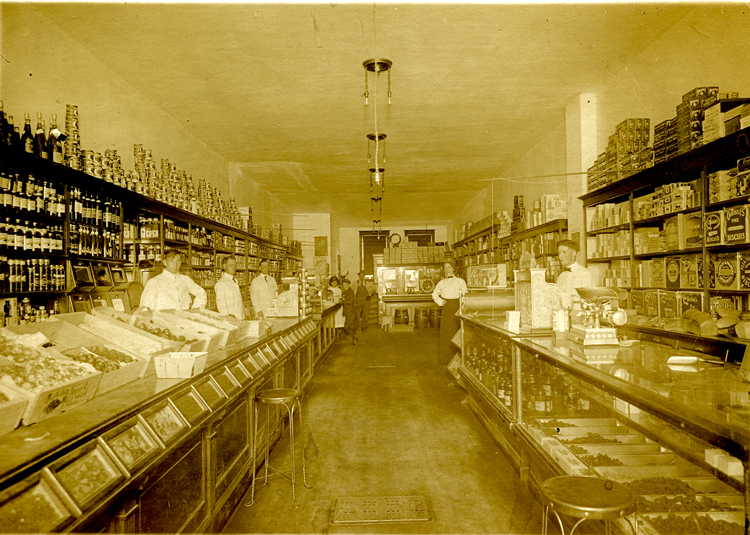 Do you recognise the interior of this shop? Location and photographer unknown, 7in x 5in print. It's very reminiscent of Cambridge Sainsbury's in pre-supermarket days, but probably quite a bit smaller. 7. Any idea of the organisation and unit? 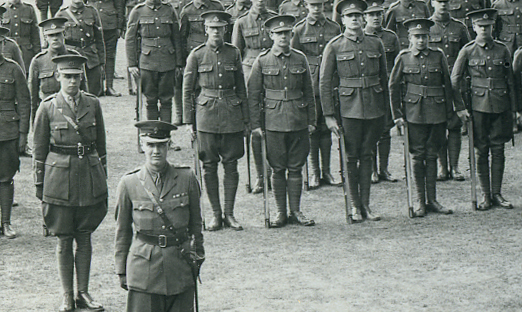 What unit and organisation might wear these uniforms? 8. Seen this car before? Is it perhaps still on the road today? It looks like a bull-nosed Morris, part of the number plate is visible which looks like the numbers 501. The photo is 4 in x 2.5 in and doesn't appear to have been a professional shot. 10. Can you help to identify this occasion and location please? From the straw boaters and large ladies hats, this is early 20th century. 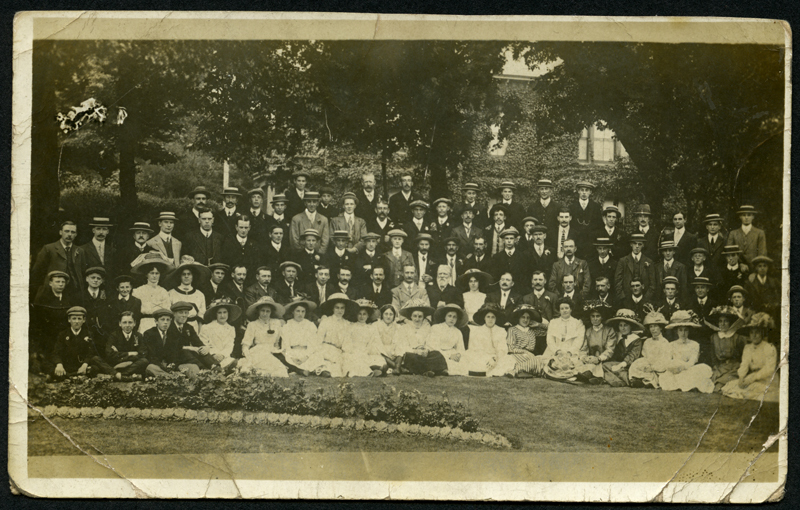 Here we have around 90 people, adults and mid teens upwards, men and women, arranged standing or seated outside an ivy clad building. All are in their best clothes, many are wearing flowers in their button holes. It's too big a group for a wedding and there are no bride and groom visible. Is it a church outing or a works outing? This could have originated anywhere in the country. The reverse is printed as a post card and pencilled into one corner is a date - 1911. This is from the Pat Saddington Collection. 11. These images show a social divide betwen "the haves" and "have nots". These are two group photos from a school or Sunday school, one with well dressed children from rich homes, the other with children in the dress of farm labourers. From the clothing they could date to around 1900 plus or minus 10 years. The two photographs are framed and measure around 12in x 9 in. There are no photographer's details. These were purchased near Bury St Edmunds in Suffolk (but could have come from anywhere). We would love to identify the location of the photographs, which we think can be identified from the unusual stonework in the background. It appears that an ornamental double arch has been created from stonework from an old arched window with pillars each side made from a pair of old pinacles from a tower - through the archway is a small building like a folly or garden temple. 12. This is a wonderful old photo from 1906. There is a mass of information pasted on the rear, but the one salient fact - the location is missing. In which country was this taken? 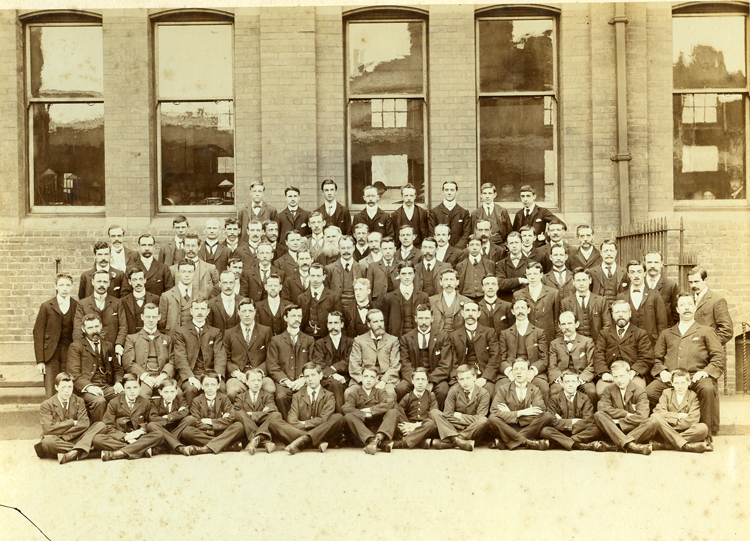 Here is what it says on the back of the photo: Taken at The Deanery Oct 20th 1906. 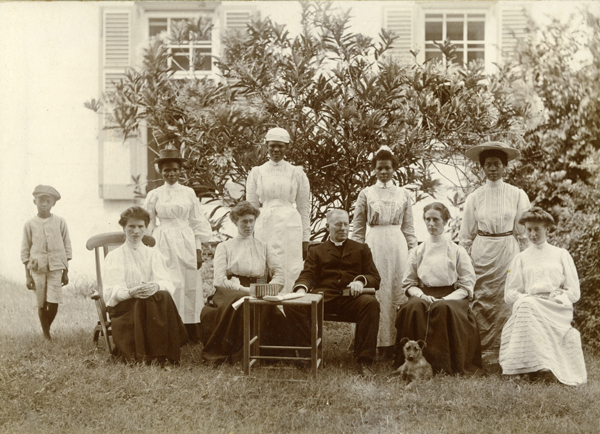 Key, left to right rear row: Robert (errand boy), Helen (kitchenmaid), Cook, Florence (Housemaid and Butler), Parris (Washer and general factotum). Front row left to right, Myself, M.E.Martin, Canon Martin, B.M.Lysous, W.J.Udall, and the dog in front - Brian. Canon Martin had this taken as a memento of our stay at the Deanery. His daughter is the one beside him. We had another taken in which I was beside Canon Martin on the other side, but it did not come our well. It is just outside the gallery windows"
Thanks to David Gobbitt who has identified Canon Martin as Canon Henry Martin (1844-1923), who was appointed as Commissary to the Bishop of Barbados in 1906 - we are in the process of checking whether the location is Barbados. 14. Who were these highly successful rowers? 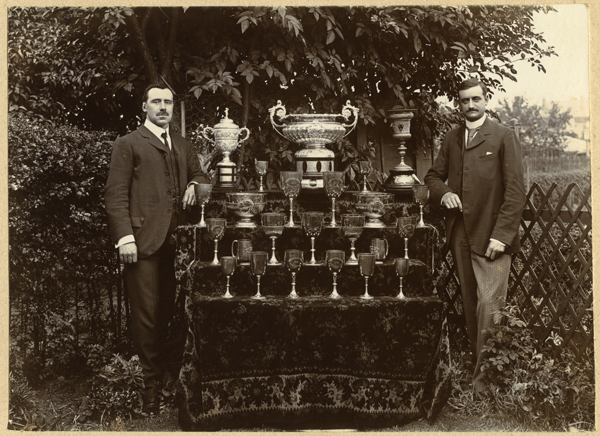 A number of these 24 cups appear to be from Burton Amateur Regatta - including the Brewers Plate and Borough Plate, dated late 1890s, 1900, 1901. As the silverware is from a regatta presumably these are rowers. The photographer is Ernest Abrahams from Burton on Trent. 15. postcard - postally unused, of military group. 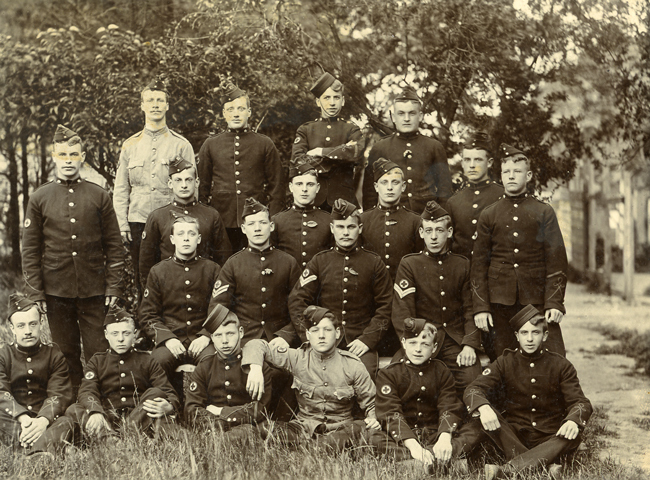 Ward 2 Squad, RASC Nov 5th 1940 - who were they? 16. an old (motorcycling?) garage from the 1930s. I don't know why, but it looks more South of England than North. A glass shows the whole building is called "The Terrace". There are signs for Lodge plugs, Pratts Perfection Motor Spirit, Ferodo brake linings, Avon and Mitchelin tyres.There is a motorcycle outside with the index number HO4289 (a Hampshire index number). Five men and a child are outside. 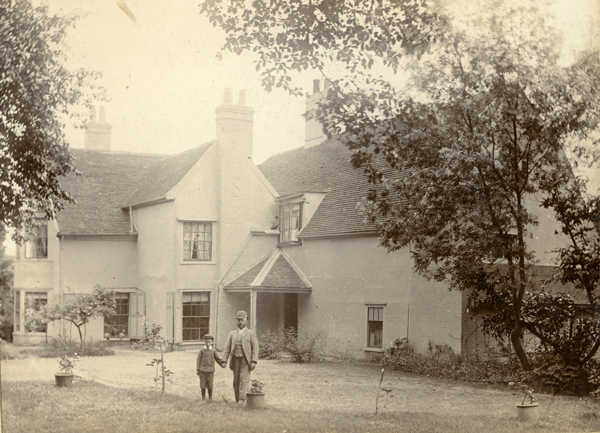 The photo was found in a junk shop in Rutland and measures 6 x 4.5 inches. 18. This photo from the 1950s? shows some sort of structure in a park or the countryside. 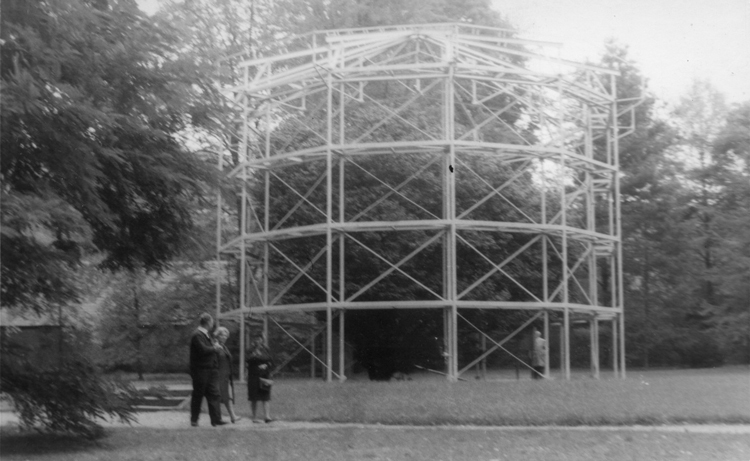 At first sight it is a bit like a gasometer frame, or the frame for a huge tent like structure. On closer examination it looks like the large structure has a large tree at its centre and walkways round the tree as different levels - reminiscent of the tree walk at Kew - but where is this and why was it constructed? 19. What is going on here? Any idea of the location? 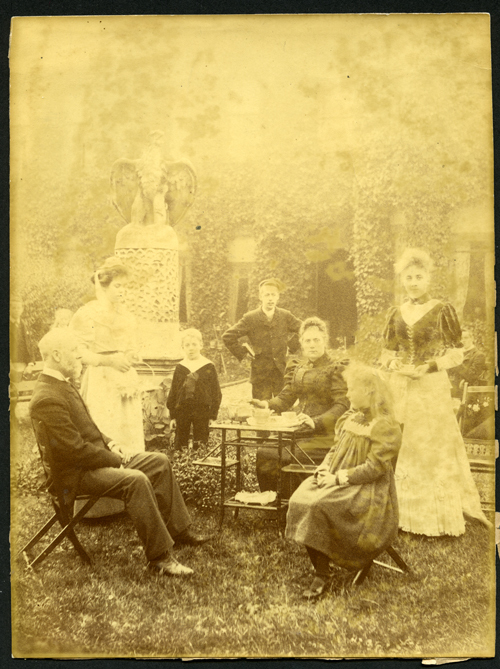 This is an 8 x 6 in sepia albumin print, probably from the 1880s. This shot looks like a tea party in a cemetery - or is the winged statue not from a cemetery. 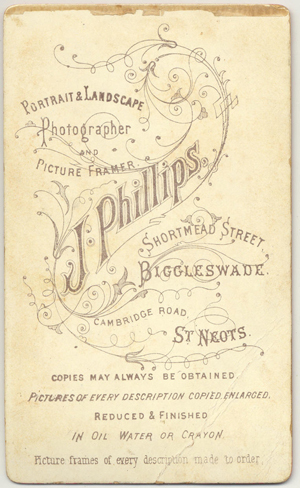 The photographer, written on the reverse is Kilpatrick, 55 Denegal Place, Belfast. 20. 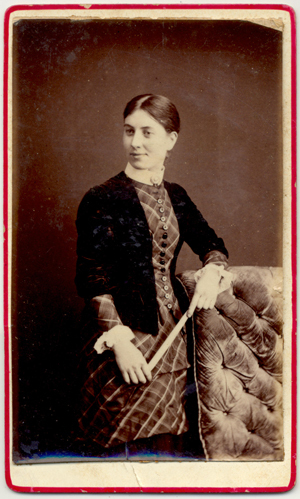 This one is from David Gobbitt's collection and David would like to know: "What is the white object the Carte de visite of an unknown attractive young woman, by Phillips of Biggleswade sitter is holding? Is it a studio prop like a fan, or could it be something more personal connected with the young woman's background or employment?" 21. Walking Pictures holiday snap by street photographer. 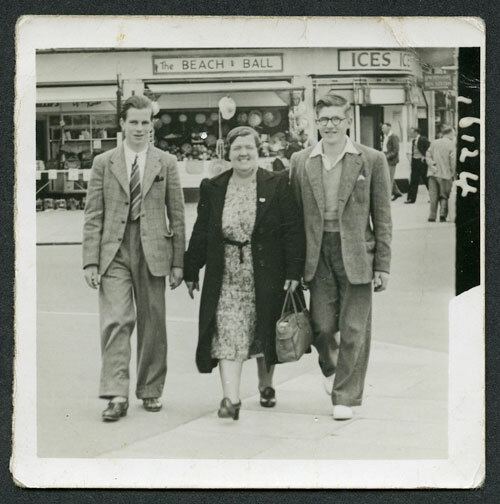 This 3 inch square black and white print shows what looks like a lady and her two sons on holiday somewhere - the heavy clothing suggests the weather might not have been too warm - in the background is a shop called "The Beach Ball", selling beach items and ice cream. There is a negative number on the right hand side 16124. There are no photographer's details recorded. Where was this taken ? a. Magnificent old Greengrocer's shop around 1900 - photo now removed - this location was identified by David Gobbitt as the shop of John Henry Creasey (1856-1934) and his son William Abraham (b. 1889) at 186 (Upper) Fore Street, Edmonton, London N1. 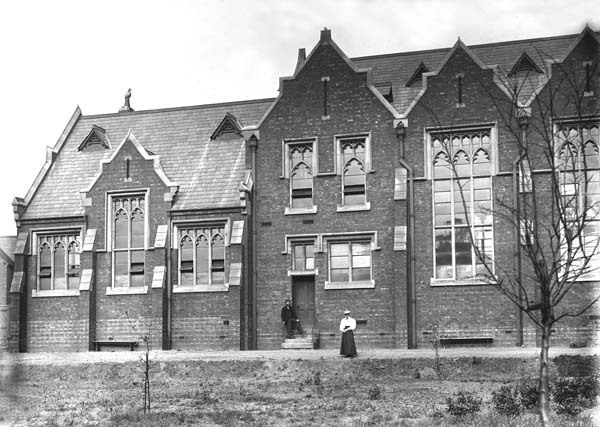 Photo now sent to the London Metropolitan Archive. b. This tiny photo shows flooding, but where? Photo now removed - identified as Ipswich 1939 by David Gobbitt. 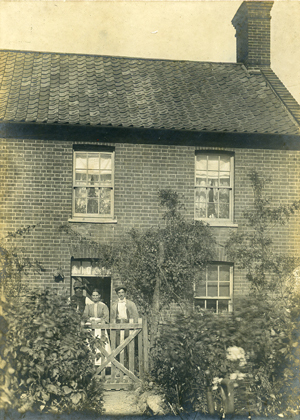 Photo now sent as a donation to Suffolk Record Office, Ipswich. c. Where was Forder's Cafe at number 317? Again, photo now removed - identified by David Gobbitt as 317 Sydenham Road, London SE26 some time between 1958 and 62. 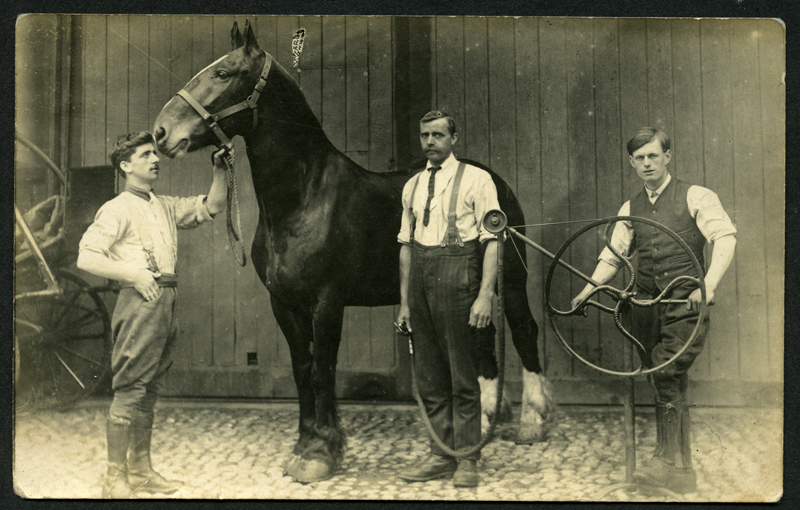 Photo now sent as a donation to The Sydenham Society. d. Lovely Victorian Butcher's shop with the staff outside. 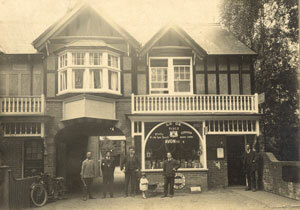 Photo now removed - this has been identified by David Gobbitt as the shop of Joseph Seal at 7 High Street, Barnes. Scan sent to them for their company website.